Alexandru Carson has a major problem and it isn't with the woman who captured him - it is the fact that he can't remember anything but his name. Confused by his inability to remember, he doesn't know where he is or how he ended up in the middle of a forest that feels bizarrely alien to him. If being lost wasn't bad enough, his fascination with and attraction to his captor is making the situation even more frustrating as he tries to unravel the mystery of what happened. Ka'ya Stargazer is an outcast among her tribe. Born with the mark of the Huntress, she is feared for her ability as a warrior even while she is a prisoner to the tribe who shuns her. When she discovers an injured man on a scouting trip, she is forced to make a decision that will change her life forever. 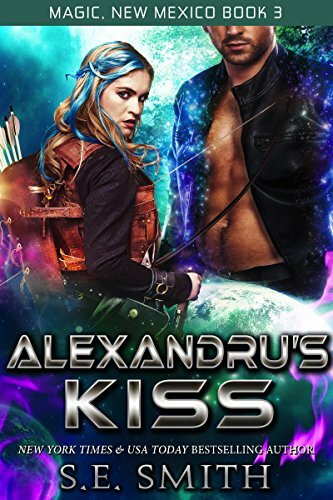 Alexandru's kiss leaves Ka'ya craving for more than her life as a warrior. Yet, even as they grow closer, there are powerful forces threatening to rip them apart. Will Alexandru accept Ka'ya's claim on him, or will she lose him forever when he regains his memory and discovers he does not belong in her world? Alexandru Carson watched from the shadows of a Juniper tree as two men approached his parents’ house. He had been waiting for one of the men – the tall man with the blond hair and an aristocratic air that clung to him. An aura of power and danger surrounded Simon Drayton. It spoke of someone who had lived for a very long time. If Alexandru had his way, that life was about to come to a very painful end. A sardonic smile curved Alexandru’s lips. Simon was so focused on his destination that the possibility of walking into a trap was the furthest thing from his mind. His gaze moved over the dark-haired man walking beside Simon. Alexandru had spoken with Simon’s personal bodyguard on many different occasions. Youssef Sharif was a quiet, dark-skinned man, and Simon respected the man’s attention to detail. It was obvious that Youssef was aware of what Simon was, yet he remained loyal to the man. Alexandru hoped it would not be a loyalty that cost the younger man his life. Youssef Sharif was human and of little threat to immortals like Simon and him. Alexandru’s eyes narrowed when Simon stepped first onto the path near the front steps of the house. On silent feet, Alexandru surged forward. He struck Simon hard in the side, lifting him up into the air, before tossing him away from the steps. If Simon had been human, the blow to his side would have broken several ribs – but, Simon wasn’t human. Even as he twisted in the air, Simon shifted, the beast inside him recognizing he was in danger. Alexandru circled around the enraged werewolf. Hatred burned through him when he thought of what Simon had done to his little sister, Tory. The fire of his magic licked through his veins. It grew more intense when Simon sniffed the air, searching for Tory. Determined to pull Simon’s attention away from his sister, Alexandru sent a powerful burst of electricity toward the werewolf. Simon jumped at the last second, barely avoiding the stunning electrical surge. His gaze flickered to the handgun in Youssef’s hand. With a snap of his fingers, the gun disappeared. The clear threat drew a soft, menacing growl from Simon. In the split second before Simon charged, he saw the tension grow in the werewolf’s body. Simon’s back paws kicked up bits of dark, red clay, grass, and rocks, scattering them behind him. The nails of his front paws grew longer and cut deep grooves into the soil. Alexandru braced himself. The second Simon lunged forward, Alexandru leaped to meet him half way. The two figures collided. Simon knocked Alexandru back several feet, but Alexandru was able to twist and wrap his hands around Simon’s throat. He jerked his head back when Simon snapped at him. The heated breath and snapping jaws was a powerful reminder that one bite could inflict serious or fatal damage. The force of Simon pushing his massive back legs against the ground had both men struggling for purchase where they grappled. Alexandru felt his grip loosening on the werewolf, and he twisted, extending his canines and slashing his fangs across Simon’s left ear. “You are dead, Simon. What you did to Tory.... The penalty is death,” Alexandru snapped in fury, throwing Simon to the side. “She was an innocent,” Alexandru retorted. “She loves him,” Youssef insisted. Rage engulfed Alexandru and he attacked with deadly intent. He jumped at the last moment and vaulted over Simon’s back. Reaching out, he wrapped his arms around the middle of the werewolf. Simon struggled to throw him off, but Alexandru locked his arms and began to squeeze. Simon fell backwards in an effort to dislodge Alexandru’s grip, but Alexandru just applied more pressure. Out of the corner of his eye, Alexandru saw Youssef rush forward to help Simon. Drawing a ball of energy in the palm of his hand, he gripped his left wrist with his right hand and twisted his left arm until he could release the ball of energy at the human. The powerful bolt struck Youssef on his left shoulder. The sound of bones breaking and Youssef’s cry of pain mixed with another sound – Tory’s cry of horror. “Stop! Nonny! Help! Alexandru, Simon, stop!” Tory cried. Hearing the voice of his sister sent a powerful surge of energy through Alexandru and he squeezed hard enough to feel Simon’s rib crack under the pressure. Alexandru released the werewolf and rolled away while Simon writhed in pain. His gaze remained focused on the werewolf. In the background he heard his sister’s panicked cry for help. Determined to finish the fight while he had the advantage, he started forward. Alexandru’s eyes widened when a dark hole suddenly appeared in front of him. The sound of Tory’s voice rising as she intoned a spell that he’d heard before. The swirling colors of a magical portal and his forward momentum all added up to his having a very, very bad feeling of how this was going to end. Unable to stop before he passed through the portal, Alexandru felt the magic surround him. Tory’s magic was unpredictable when she knew what she was doing. It was chaotic when she did it without realizing what she was saying. There was no telling where – or in some cases when – he might find himself. For a moment, he thought his body was going to be pulled apart from the ferocious storm of magic swirling through the long, wormlike tunnel. He tumbled head over heels before being expelled out the other end. His feet landed on soft, uneven ground. Unable to keep his balance, he tumbled down the slope. The downward momentum seemed to continue forever before he felt a moment of weightlessness. The next moment he landed with a heavy thud on a path at the bottom. He rolled several times before he came to a stop, his head striking a rock. Darkness swam before his eyes, the world spun crazily, dizzily around him for a brief second before everything faded to a peaceful black. The last thing that Alexandru remembered before his eyes closed was that he didn’t remember there being such a thick, lush forest near Magic, New Mexico. His head dropped down against the cool, damp soil and his body relaxed, blissfully silencing the thundering pounding that had begun to beat at his temple. Ka’ya Stargazer glanced away from the group of young men, all still in their teens, who stood near the fountain. She placed her jug on the wide rim and propped her bow against the side. Their voices faded to silence and she could feel their wary gazes on her. Ignoring them, she picked up her jug and filled it before retrieving her bow. “Huntress,” a voice called out from across the wide road. Ka’ya turned and watched as two of the tribal Elders approached her. Her lips tightened in annoyance. They never approached her singly. Fear – it had a smell to it with which she was all too familiar. At times, the fear of the tribe threatened to choke her. “Yes, Elder Mayleaf,” Ka’ya greeted with a bow of her head. “We were told you had returned from the caves. You were successful in killing the beast that attacked the outer farms?” Elder Mayleaf asked. Ka’ya’s mouth tightened and she bit back the words that threatened to escape from her lips. The ‘beast’ had turned out to be two Cybear cubs whose mother had been killed by a farmer. The cubs were starving and had ventured into the fields looking for food. Ka’ya had spent half a day gathering berries and leading the creatures through a mountain pass to where a large supply of fresh berries, insects, and edible flowers grew. She suspected the mother Cybear had been crossing back to its summer residence after birthing the cubs at a higher elevation. “Eat if you must, but make it quick. Raiders were spotted on the high trail to the north. We need you to see if they have moved on,” Elder Direwolf instructed. Ka’ya frowned. There had been no raids against the village in almost four years. She had come across a lone raider only a few times since then. There were tales that a new leader had taken control of the Vikar and was making changes. She had seen some of those changes when she visited the city of Perth almost a year ago. “Huntress, did you hear Elder Direwolf?” Elder Mayleaf asked, breaking into her reverie. “Yes, Elder. I will leave at first light,” Ka’ya replied. Ka’ya shook her head. “That is why we have the boundary. The lines are secure. I checked them before I came for water,” she said impatiently. “You will leave tonight,” Elder Direwolf ordered. Ka’ya was about to argue, but bit back her frustrated retort when she saw the expression in Elder Direwolf’s eyes. His gaze swept the open area of the village, pausing on a young boy playing with a stick and pebble outside one of the huts. She stepped to the left, cutting off his view of the boy. “I will leave immediately,” she quietly replied with another bow of her head. Neither Elder spoke again. They simply turned and walked away from her. Ka’ya stared blindly at the ground until she knew they were far enough away that it was safe for her to turn to look at the boy again. Her expression softened when an older woman came out from the small hut to get him. For a fraction of a second, Ka’ya’s gaze locked with the woman’s – her mother – before her brother said something, pulling her mother’s attention away. “Protect us, Huntress,” one of the young men by the fountain mocked, waving his hands in the air while his friends laughed. “Off into the night with you, Huntress,” another teen taunted. The boys remained frozen, but she saw the way they shrank back from her, their shoulders raising defensively when she took a step toward them. They parted, watching her with a wariness that spoke of their fear of her when she walked between them. Ka’ya kept her head held high. She had made a promise to herself when she was younger to never let the opinions of the others in her village affect the way she felt about herself. Doubting herself would leave her vulnerable to the jagged spears of animosity. Her gaze swept to the hut where her mother and young brother had disappeared inside. It was dangerous to approach them too often. It was better if she acted as if she didn’t care. The Elders’ unspoken threat against her family lurked with malignant intent under every order she was given and she had no desire to give them more incentive to use her mother and brother against her. Her father had already paid the ultimate price to protect her. They had banished him from the village nearly ten years ago when her brother was but a babe and she was twelve. All because of the mark she was born with – the mark of the Huntress. The superstitions of the tribe were deeply rooted, and one man, Jorge, the spiritual leader of her people, used those superstitions with the same deadly accuracy as she did her bow or blade. Her mother had told her Jorge had the ear of the old chief and the other Elders long before she was born. Her mother told her that Jorge was a stranger who appeared a few years before her mother met her father. He had spoken in an unusual tongue, but had been accepted when he saved the life of the village chief from a pack of wolfhounds. Her mother shared how Jorge had come with strange and mysterious things that he said came from the Goddess. The old chief had believed Jorge and proclaimed him their Spiritual Leader. When the old chief died, Jorge proclaimed that he would guide the village along with the old chief’s son. By the time this happened, her father had arrived and tried to warn the son of the old chief of the dangers of allowing Jorge such power. She remembered the expression on her mother’s face – the fear – when she quietly told Ka’ya how the new chief and the Elder council had threatened to banish her mother’s entire family if her father did not cease his resistance to Jorge. Ka’ya understood how difficult it must have been for her father. He had still been considered an outsider – much as she was – up until the day he had finally pushed Jorge too far. Shortly after her father’s banishment, the new chief mysteriously died and Jorge had rapidly replaced the Elders who stepped down with those in the village who supported his beliefs. Since then, Jorge had ruled the village with a ruthlessness that bordered on insanity. Jorge had become more reclusive in recent years, but he had also become more powerful. Unfortunately for Ka’ya, Jorge both feared and desired her. It mattered not to him that she was still a child. He believed if he possessed her, it would give him the power of the Huntress. A smile curved Ka’ya’s lips when she remembered her father’s response to Jorge’s demands that her family hand her over to the Spiritual Leader. Her father believed slicing Jorge’s blackened heart out of his chest would be the better alternative. The smile faded when she remembered the price her family had paid for defying Jorge’s demands. Days after her father’s banishment for threatening to kill the Spiritual Leader, the Elders of the village had dragged her before the cruel, horrid man. Ka’ya stiffly stood between the two Elders who had brought her to the spiritual leader’s hut. Her nose wrinkled at the foul smell of burning spices. The smoke from it burned her eyes, but she refused to rub them. The woman on her right smothered a cough while the man to her left raised a hand and wiped at the corner of his eye. She stared at the room with distaste. The dim interior was depressing. It was nothing like the brightly lit interior of her home. The ceiling was covered in soot and made the little light that streamed down through the ceiling look gray and dirty. The bones of dead animals lay scattered across a long table and on the floor. Bottles of liquids lined several shelves against a wall. Everything looked dirty and unkempt. Ka’ya did not understand how this man could declare himself better than her father. He knew nothing of what it meant to understand the spirit of the land and animals. “She is here, Spiritual Leader,” the woman called. Ka’ya watched as Jorge appeared from another room. He was a thin man with beady, almost black eyes. Dark shadows under them made the sockets around his eyes appear larger than they were in reality. His alabaster skin was streaked with smudges of soot from his dirty fingers and made him look older than his thirty years. He wore a dirty, off-white tunic over dark brown pants and boots. His hair was thin on top, with just a few strands of fine hair that made a line and was swept to the side. He silently returned Ka’ya’s stare, as if willing her to look away first. Instead, she lifted her chin. Her light green eyes bore into his. She could see the circle of light from the open door surrounding the brown irises of each eye, giving them a malevolent glow. In the center, she could see her reflection. Even when he took a step forward and ran his dirty fingers down along her cheek, she didn’t turn away. His eyes narrowed and he gripped her chin hard. “Do you think to defy me, girl?” he demanded in a reedy voice. Ka’ya pulled her chin free and glared at him. “Yes,” she replied, biting her tongue to keep from saying anything else. Jorge gazed down at her. She silently returned his stare. She didn’t flinch when he raised his hand to strike her. The blow never came – thanks to the sounding of the alarms. Jorge glanced up at the man standing next to her and jerked his head toward the door. “Find out what is happening,” he ordered. Ka’ya turned slightly when the Elder opened the door. There was a thud that reverberated through her and the Elder stumbled back. In the center of the elder’s chest the long shaft of an arrow protruded. The woman at her side screamed when several more arrows flew through the door. Jorge and the woman fell to the ground. Ka’ya took advantage of the open door and bolted. Emerging outside, she could see more than two dozen Vikar swarming through the village setting fire to carts of hay and slicing through the men who charged them. Her gaze moved to one of the raiders. He was dragging her mother out of their home. Her mother was holding her newborn brother protectively in her arms. Ka’ya started forward. Her gaze fixed on her mother and brother; she bent near the body of a fallen guard and pulled the bloody sword from his body. The moment her hand wound around the handle, power exploded through her body and a flood of knowledge swept through her mind. It was as if she had lived through thousands of battles, had hunted the greatest beasts, and knew what needed to be done. She gripped the sword with a strength that belied her tender years, twirled, and sliced through one of the attackers as he reached for her. As she neared her family’s hut, the raider who had her mother’s arm, lifted the long shaft of his spear to strike her mother dead. Ka’ya pulled her arm back and threw the sword. The blade sank deep in the raider’s chest, driving him back against the stone wall of the hut. Racing forward, Ka’ya knelt and helped her mother to her feet. “Inside,” she said in a soft urgent tone. “Ka’ya,” her mother whispered, reaching out to run a trembling hand down her daughter’s face. Ka’ya smiled. “Go inside. I will protect you,” she said. Mayli looked worriedly back at her daughter, but hurried inside. Her brother whimpered, but her mother quickly soothed him. Ka’ya followed her mother into the bright hut. She could feel her mother’s gaze on her when she reached for her father’s bow and arrows. “Ka’ya, don’t go,” Mayli begged when Ka’ya turned back to the door. Ka’ya glanced at her mother. In the background the sounds of screams and fighting continued. Her face tightened and once again she felt the surge of power rush through her. She knew that if the raiders were not defeated or driven off, there would be nothing left of the village – including her family. “I have to,” Ka’ya replied, turning and drawing back an arrow when the door opened. She released the arrow. The raider standing in the doorway looked down in surprise before he fell forward. Ka’ya pulled another arrow from her quiver and walked toward the door. Stepping over the body of the dead raider, she released three more arrows in rapid succession before disappearing outside. Ten arrows – ten raiders dead by her bow. By her sword, she killed another five before the raiders began to target her en masse. Ka’ya knew she was in trouble, but she never gave up. She pulled on the power flowing through her and used the knowledge to strike one deadly blow after another. Ka’ya’s desperate need to protect her mother and infant brother gave her the willpower to continue fighting. Revived by the dwindling number of raiders, the villagers began fighting beside her until the remaining raiders retreated in defeat. Ka’ya turned in a slow circle as the remaining villagers who had sought to hide slowly emerged from their huts and gathered around her. She could feel their gazes on her and she smiled. Jorge stepped out of his hut where he had been hiding, and she eyed him with contempt. Gripping a bloody sword in her right hand, she reached up with her left and pushed her thin tunic to the side to reveal her shoulder and the mark of the Huntress. The mark that her parents had tried to hide, the one that Jorge had somehow found out about and decided to use for his own purpose, was now clear for all to see. She would not hide any longer. No one would control her.